Description: JASMINE ESSENTIAL OIL (Jasminum officinale): "Jasmine has delicate star shaped sweet, fragrant flowers. In many religions the flower symbolizes hope, happiness and love." Their scent is known to be one of the most exotic. "It is an excellent essential oil for dehydrated, dry, mature skin with its qualities for smoothing, soothing and toning skin. Jasmine has been used to normalizes oil production in the skin" In China jasmine is known as Moli and the Hindus call it moonlight of the grove. Western cultures use it as an aphrodisiac scent. The Chinese use it to aid nervousness and is known to be a calming essential oil. Jasmine is a Japanese favourite for tea and incense. Jasmine in India was called the Queen of the Night and used for increasing loving feelings and spiritual growth. It is very often used by international and high end perfume companies." "Jasmine flowers are harvested only at night. It takes about 1,000 pounds of Jasmine flowers, 3.5 million blossoms to yield 1 once of jasmine essential oil." For these reasons it is one of the most expensive essential oils in the world. 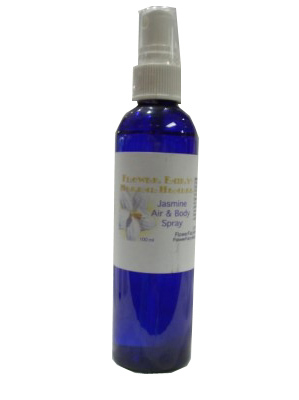 It is the only essential oil Flower Fairy Herbal Healers use that is a blend of natural and synthetic essential oil of jasmine. This enables the consumer to have access to this normally, unavailable exotic oil. This is possible due to the blend is a significantly lower price. However the natural components and natural properties are still included and thus it is still beneficial in it's properties. We are always aware of the source and quality of all our essential oils. Directions: Shake well before using. Use as an air, body and line spray. Spritz a bit away from item. This can be used in for calming, especially on bedroom and lightly mist on non-delicate pillows and bed linens to help calm & soothe the body & mind, encourage a peaceful slumber and increase dreamtime. It’s pleasant fragrance can be also used room in bathrooms, in the air to freshen or to reduce odours. Clean may be a useful spritz. Ingredients: Fresh, Hand Picked, Home Grown, Jasmine Flower Heads, & Natural & Fragrance Jasmine Essential Oils, 800 IU Natural Vitamin E Oil, Jojoba Oil & In A Base Energized Reverse Osmosis H20, Grapefruit Seed Extract & Food Grade Grain Alcohol. Bottled in a hard plastic cobalt blue spray bottle.